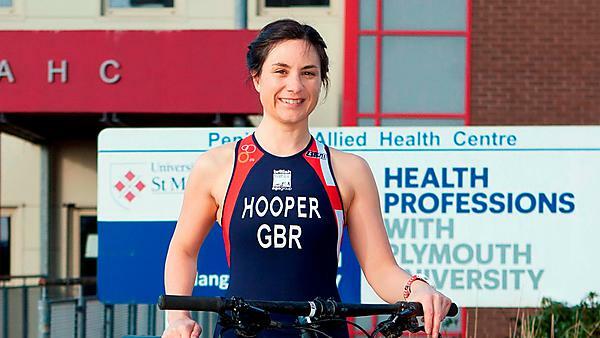 Physiotherapy student Sharn Hooper will be competing for Great Britain in two European Triathlon Union events. A physiotherapy student from Plymouth University has qualified to represent Great Britain at two prominent athletic events. Sharn Hooper, 31, will be competing in the age 30-35 category of the European Triathlon Union (ETU) Cross Duathlon Championships in Romania on 23 April, and at the ETU Cross Triathlon Championships on 23 June in Switzerland. She was chosen after posting a number of successful results in triathlon, cycling and cross country races throughout the year. Incorporating a 6km run followed by an 18km bike ride and a 3km run, all off road, this Saturday’s duathlon is one of Sharn’s toughest challenges to date, after competing in events ranging from Iron Man to mountain biking. As well representing her country, the first-year physiotherapy student is looking forward to the fitness challenge, and has used the clinical skills acquired on the course to keep herself in top shape. “I have always been a sports fanatic and trained really hard – recently I attended two cycling training camps in Wales and Mallorca – so qualifying for these events is absolutely fantastic. I’m also fascinated by health and fitness, which inspired me to undertake a physiotherapy course. By understanding how the human body works, and helping to improve the quality of others’ lives, the course enables me to develop my skills and help to improve my own fitness. To follow Sharn’s progress, find her on Twitter @SharnHPhysio.